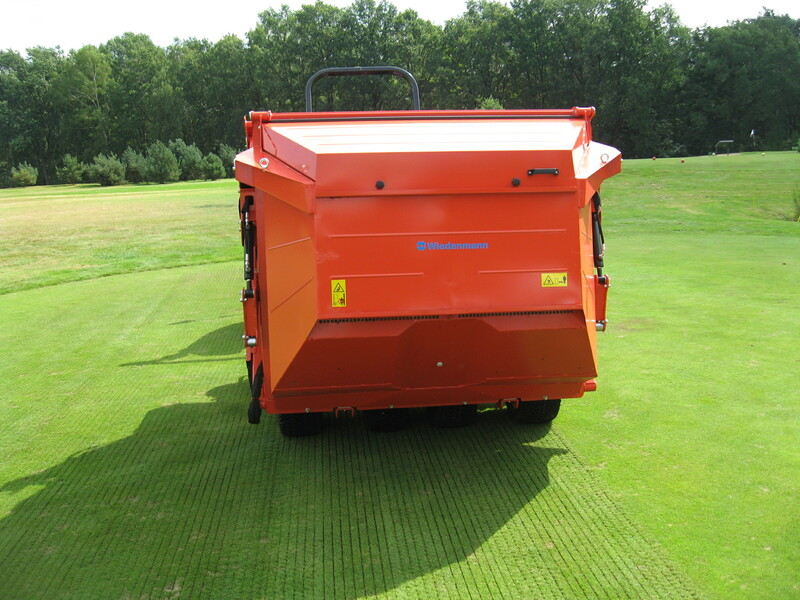 Rumours abound that Wiedenmann UK has a new sweeper collector likely to land in the UK early this summer. The Super 1300 is thought to be styled on its very popular Super 500 and 600 machines which are recognised for their versatility and ability to scarify, sweep, cut and collect and vacuum pack their huge tanks. This smaller version is likely to have a high dump of 1.7m and be configured to sweep turf and leaves with a unique double brush head system, and the top one aiding collection. With its 4500 litre tank, the Super 600 is one of the most productive machines on the market. A step up from the very popular Super 500 which itself boasts a handsome 2500 litre capacity, it has established itself as an attractive proposition for local authority users as it is especially suited to park grounds, extensively maintained areas, ecological meadows, sports grounds and golf facilities. In-cab remote control allows the operator to easily change the three operating functions – head unit lift and lower, hopper lift and hopper tip. In any of its modes it produces a high airflow which ensures that the collected material is well compacted. It is extremely manoeuvrable with a light footprint, pneumatic tyres minimising pressure on fine turf areas. The container lifts via a parallel system, the hopper rotating to allow it to completely discharge collected material. In sweeper mode it has a fully floating head with 1.6 metre working width, which ensures a clean, even pass over undulating ground; its powerful, high performance vacuum collects leaves, litter and other debris and deposits them into the vast hopper. An extremely ingenious wheel locking system allows the four swinging axle wheels to float and pivot during work but lock into a fixed position when the tank is raised for tipping, giving a particularly stable base to empty from making it a very safe operation. A professional clean finish is left every time. Working depth or height of cut is easily and quickly adjusted.